Pin head and part of shaft. The head is of 'biconical with median band' shape, appears to be undecorated, and is 7-8 mm in diameter. There is no collar beneath the head; the shaft tapers from 3 mm diameter at the top to 2 mm diameter, bends and is then broken. The break extends up the middle of the shaft, suggesting that it was made in two pieces then hammered together. 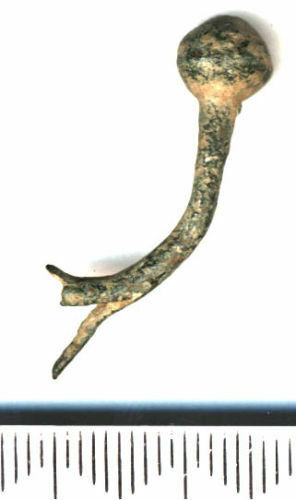 Dating of pins with no collar can be difficult as there is little difference between middle Anglo-Saxon and Roman examples, but the shape of the head and the construction of the shaft both suggest a middle Anglo-Saxon date. Current bent length is 31 mm.